Are open kitchens back in trend ? Find out what people are doing with Open Shelf kitchens and why. Recessed kitchen is now in trend. So I thought and did read a few articles on some of the interior design magazines. When it comes to interior decoration, I want to know whats new. Unlike many people I have a very different mind set and mood. I love change. I love change in careers and I love change in hobbies. I used to love to ride a bike, then it was driving, for a while I did photography and right now I am into learning the guitar. I get bored quickly and there are very little things that I don’t get bored with. Living in the same house for a long time can make things a bit “boring”. you see the sofa in the same place every day for the past 2 years. The beds have not changed positions and the wall color is the same. I don’t really like it. I rarely get a chance to decorate my room and thankfully, my wife loves to change things at home. For her, its more about functionality. For me its all about looks. That is when I cane across a magazine which showed a beautiful open shelf kitchen. My first thought was “AWESOME”! and then a moment of realization! Sheez that would look horrible if we did it and it looks only good on picture. My wife was fully on with the idea because she found it far more functional. She would know what is kept where. She wouldn’t have to hunt for that kitchen knife or that pan which she uses rarely, because she doesn’t remember where she placed it! Grommet Curtains are simple! These modern-looking curtains are perfect chic options for any window treatments. Good to hang and easy to handle! Look on for the top seller varieties and new arrivals at Half Price Drapes. 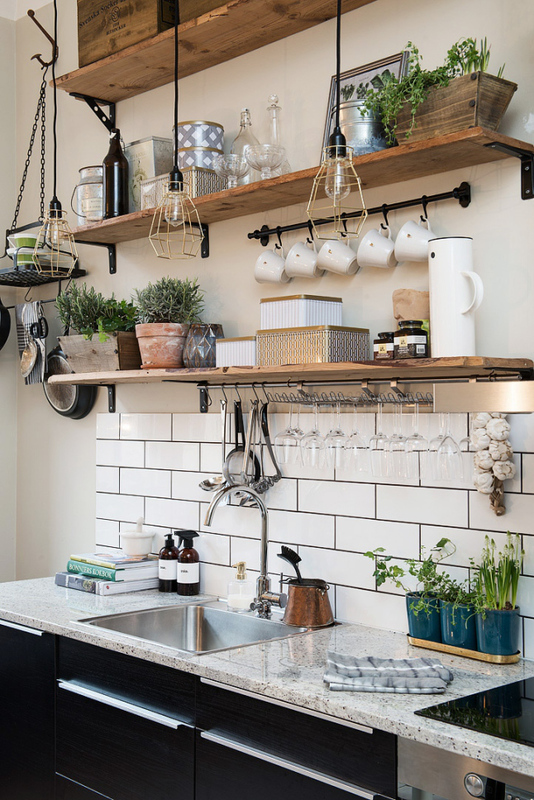 But is the Open shelf kitchen with pans hanging from the ceiling a practical idea? I am not sure that I want to see pans hanging from the ceiling as though it was not my home but a street side chinese restaurant! Who really wants to see pans hanging from the ceiling ! that was hardly any idea for decoration. Well open kitchens are in fact one of the best things which could happen to most people who have little to medium level kitchen utensils. If you are 2 people and cook with limited utensils, then this is just right for you. You can bring in the right looks, though you would want to invest in the right crockery. The key is to get the right containers, all with the same material. Glass is the most common in containers. IF you have brass or Copper cooking utensils, it could add up to the looks of the kitchen. Its not just another cooking pan hanging from the ceiling anymore. Its really different. Add it up with some herbs on pots and you would be amazed at what you can achieve. The looks of a open shelf kitchen is not to be underestimated. Though these kitchens could be hard to maintain, you will be able to save a lot more time with the open shelf ideas rather than a closed cabiets. Whats more important is that you will have plenty of space (though it looks cluttered) . there are no closed cabinets which take up the space you could use !